On June 14, 2009, I raced Ironman Eagleman 70.3 as my first Half Ironman race. While I'm typically very numbers centric and oriented, I wanted this race report to be more of a "touchy feelie" type of recap as I feel (see?) that is the best path to improvement for me. My wife Dawn and I traveled down to Cambridge, MD on the Friday before the race as I wanted to get settled early and recover from the 5+ hour car ride. We stopped a few times along the way, hooking up with some friends for lunch at a Cracker Barrel along the way. When we got to Cambridge, we went to the race check in, got my number (lucky #772), swag bag, and checked out the small expo realizing it is bad news when even though you already seem to have everything some extra stuff caused some money to jump out of my wallet. Did some local shopping at Walmart for staples (fresh bagels for breakfast, chocolate milk for recovery, Gatorade, some bottled water for the hotel room, PAM for the wetsuit, etc). Ate a quick dinner at the Greek/Italian Palace and when to bed early. Saturday's plan was to do a short swim, bike and run. I was scheduled to meet those same Cracker Barrel and other Eaglefriends for an open water swim starting at 7am but they rescheduled to 9am as other folks were coming in late or staying up late. This year Eagleman had a new swim course since the boat ramp typically used for the swim exit was under construction so the buoys were on the right rather than the left (good news for right side breathers like me). We started swimming from the finish out to the last buoy and stood up (the water was about 4 1/2 ft deep here) and found the water as a salt water light (they estimated about 20% salt water as the upstream Choptank River was fresh and the downstream Chesapeake Bay was salt). Swam then to the second to last buoy and found the water a little deeper. Turned around to get landmarks for siting and easily swam in. Regrouped for a short ride and a short run and then headed back to the hotel. All was good but it seemed like it was getting hot, humid and windy. I decided to go to the pre-race meeting figuring if I got anything out of it it could be beneficial. They stated that a focus area of enforcement was wearing numbers facing back on the bike. The race director then stated that the water temperature was measured at 78 and there was a possibility of a non-wetsuit swim. For me, this is about the worse thing that he could have said. I'm not a confident swimmer and the last triathlon that I did that was non-wetsuit was a train wreck of epic proportions (but that is a story for another day). My freaking out started. I wrapped up my bike as the forecast called for a chance of rain overnight and checked it in. The freaking out continued. Ate some Denny's pancakes and went back to the hotel. The freaking out level increased. That "chance" of rain proved to be an understatement. Violent storms hit the area at about 1am and between constant worries about the no wetsuit possibility (should I even start?, am I doomed?, I promised to really learn how to swim, etc) and walls shaking from the thunder, I got no sleep at all. Got out of bed at 4am (note I didn't say woke up), took a shower, ate breakfast and got to the race site at a little after transition opened at 5am. The transition area was in a place called Great Marsh Park and the rain from the night before made me realize why the park was named as it was. The rain turned the park's grass into a mud pit mixed with a little bit of swamp (Shrek would have been comfortable). There were inches of water on the bike and standing water all around. I started setting up and heard the magic words over the PA, "the official water temperature is 76.4 degrees so wetsuits will be allowed." My freaking out stopped and my blood pressure probably went down 50 points after hearing that announcement. 76.4 is one of my new favorite numbers. It still looked like it could rain some more with full cloud cover so I put my run stuff in plastic to prevent it from getting soaked. My plan for the swim was to just take it smooth, remembering to reach, have full strokes, to glide, and find feet where I could. Eagleman has a reputation as a choppy swim but the water seemed fine to me. My wave (M45-49, #5) got into the water and it seemed that no one wanted to get in front while waiting for the start. When we started swimming I kept drifting a little left but overall I was having a decent swim until about half way through, my face started burning. JELLY FISH. I tried to swim through them and it got better for a few minutes and then it started again. I was able to keep my pace steady until the swim end. I felt really fresh at the end of the swim and mentally convinced myself that if I ever had to double the length of the swim (in a few years perhaps), that shouldn't be an issue. Other issues, unfortunately, would come sooner rather than later. I did my swim/bike transition and heard they were playing Jackson Brown's "Running on Empty" over the PA. I told the race announcer as I ran by that this was a bad song to play today and he laughed. I got on the bike but found I couldn't clip in since there was too much mud in my cleats. I was able to stay on the bike and be a contortionist to get the mud out, clipped in and focused on not going too hard to save myself for the wind (another Eagleman "reputation") and the following run. That plan didn't work as fatigue set in suddenly and way too early. All energy seemed to leave my body. I tried eating and drinking to cure the fatigue to no success. I thought maybe I was pushing too hard but that wasn't the case either as I was under my power and HR targets. My pace was about where I wanted so I rationalized it was either the lack of sleep or that the swim took too much out of me. In any event, I realized that this wasn't going to be my best day physically so I accepted that remembering the quote "all you can do is all you can do." Then the course turned into the wind for the next 25 miles or so. Fatigue and wind don't mix well but I was able to keep the pedals turning. Fortunately, I finished the bike right at about the time that I estimated. I took my run stuff out of the plastic and started to run. My plan was to take a break at each water stop to rehydrate and just concentrate on going mile to mile. I found my pace much slower than expected and the fatigue still there so I didn't push very hard as my primary goal was to just finish. The run course is an out and back. The wind was in my face on the way out and I looked forward to having the tailwind help me on the return. I don't know why tail winds never seem to make up for head winds but that proved the case yet again. At about the 7 mile mark, a 5 ft long snake came out of the woods onto the road. People started screaming but I kept thinking of how to race a bear (you only need to be faster than one other person) and chuckled. My run plan worked until about the 9 mile mark and then I started walking more. At about 11 miles I realized that there was still a chance to hit my time goal so I started running more in earnest again. I finshed and made my time goal by seconds. I can finish a half ironman. 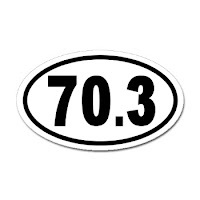 I added two favorite numbers to my list: 76.4 and 70.3. I've been happy all week afterwards. In addition to 6/14 being Flag day and the day the Rangers won the Stanley cup in 1994, it will always be Eagleday for me. Congratulations Rockstar on finishing your first Half Ironman. I too am nearly 4 dozen years old and a triathlete - battling weight issues but doing it anyway. I hope to complete an "unofficial" Half Iron distance this fall. I enjoy reading your blog and can relate to the ups and downs and the freaking out! I look forward to reading about your continued efforts and triumphs in the future.